This article is about the Second World War defensive line. 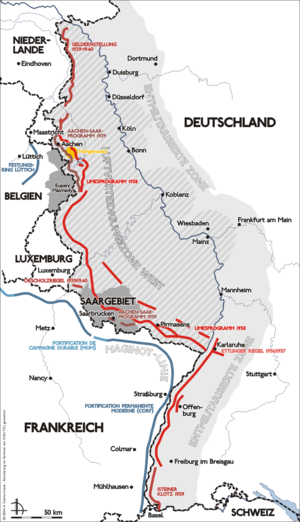 For the First World War "Siegfriedstellung", see Hindenburg Line. From September 1944 to March 1945 the Siegfried Line was subjected to a large-scale Allied offensive. The official name for German defensive line construction program before and during the Second World War that collectively came to be known as the "Westwall" (and "Siegfried Line" in English) changed several times during the late 1930s reflecting areas in progress. These programmes were all pushed forward with the highest priority, putting a concentrated demand on available resources. The origin of the name "Westwall" is unknown, but it appeared in popular use from the middle of 1939; there is a record of Hitler sending an Order of the Day to the soldiers and the workers at the "Westwall" on 20 May 1939. Small bunkers with 50 cm (20 in) thick walls were set up with three embrasures towards the front. Sleeping accommodations were hammocks. In exposed positions, similar small bunkers were erected with small round armoured "lookout" sections on the roofs. The programme was carried out by the Border Watch (Grenzwacht), a small military troop activated in the Rhineland immediately after the region was re-militarised by Germany after having been de-militarised following the First World War. Heating was from a safety oven, the chimney of which was covered with a thick grating. Space was tight, with about 1 m2 (11 sq ft) per soldier, who was given a sleeping-place and a stool; the commanding officer had a chair. Surviving examples still retain signs warning "Walls have ears" and "Lights out when embrasures are open!" The Western Air Defence Zone (Luftverteidigungszone West or LVZ West) continued parallel to the two other lines toward the east, and consisted mainly of concrete Flak foundations. Scattered MG42 and MG34 emplacements added additional defence against both air and land targets. Flak turrets were designed to force enemy planes to fly higher, thus decreasing the accuracy of their bombing. These towers[clarification needed] were protected at close range by bunkers from the Limes and Aachen-Saar programmes. The Geldern Emplacement lengthened the Siegfried Line northwards as far as Kleve on the Rhine, and was built after the start of the Second World War. The Siegfried Line originally ended in the north near Brüggen in the Viersen district. The primary constructions were unarmed dugouts, but their extremely strong concrete design afforded excellent protection to the occupants. For camouflage they were often built near farms. Standard construction elements such as large Regelbau bunkers, smaller concrete "pillboxes", and "dragon's teeth" anti-tank obstacles were built as part of each construction phase, sometimes by the thousands. This standardisation was the most effective use of scarce raw materials, transport and workers. "Dragon's teeth" tank traps were also known as Höcker in German ("humps" or "pimples" in English) because of their shape. These blocks of reinforced concrete stand in several rows on a single foundation. There are two typical sorts of barrier: Type 1938 with four rows of teeth getting higher toward the back, and Type 1939 with five rows of such teeth. Many other irregular lines of teeth were also built. Another design of tank obstacle, known as the Czech hedgehog, was made by welding together several bars of steel in such a way that any tank rolling over it would get stuck. If the contour of the land allowed it, water-filled ditches were dug instead of tank traps. Examples of this kind of defence are those north of Aachen near Geilenkirchen. The early fortifications were mostly built by private firms, but the private sector was unable to provide the number of workers needed for the programmes that followed; this gap was filled by the Todt Organisation. With this organisation's help, huge numbers of forced labourers — up to 500,000 at a time — worked on the Siegfried Line. Transport of materials and workers from all across Germany was managed by the Deutsche Reichsbahn railway company, which took advantage of the well-developed strategic railway lines built on Germany's western border in World War I. Working conditions were highly dangerous. For example, the most primitive means had to be used to handle and assemble extremely heavy armour plating, weighing up to 60 tonnes (66 short tons). Life on the building site and after work was monotonous, and many people gave up and left. Most workers received the West Wall Medal for their service. The Siegfried Line at the start of the Second World War had serious weaknesses. German General Alfred Jodl said after the war that it was "little better than a building site in 1939", and when Field Marshal Gerd von Rundstedt inspected the line, the weak construction and insufficient weapons caused him to laugh. Despite France's declaration of war on Germany at the beginning of the Second World War, there was no major combat at the Siegfried Line at the start of the campaign in the west, except for a minor offensive by the French. Instead, both sides remained stuck in the so-called Phoney War, where neither side attacked the other and both stayed in their safe positions. The Reich Ministry of Public Enlightenment and Propaganda drew foreign attention to the unfinished Westwall, in several instances showcasing incomplete or test positions to portray the project finished and ready for action. During the Battle of France, French forces made minor attacks against some parts of the line but the majority was left untested. When the campaign finished, transportable weapons and materials (metal doors for instance) were removed from the Siegfried Line and used in other places such as the Atlantic Wall defences. The concrete sections were left in place in the countryside and soon became completely unfit for defence. The bunkers were instead used for storage. Even during construction, it was becoming clear that the bunkers could not withstand the newly developed armour-piercing weapons. At the same time as the reactivation of the Siegfried Line, small concrete "Tobruks" were built along the borders of the occupied area. These bunkers were mostly dugouts for single soldiers. In August 1944, the first clashes took place on the Siegfried Line; the section of the line where most fighting took place was the Hürtgenwald (Hürtgen Forest) area in the Eifel, 20 km (12 mi) southeast of Aachen. The Aachen Gap was the logical route into Germany's Rhineland and a main industrial area, and was therefore where the Germans concentrated their defence. The Americans committed an estimated 120,000 troops plus reinforcements to the Battle of Hurtgen Forest. The battle in this heavily forested area claimed the lives of 24,000 American soldiers plus 9,000 of so-called nonbattle casualties—those evacuated because of fatigue, exposure, accidents, and disease. The German death toll is not documented. There were serious clashes along other parts of the Siegfried Line and soldiers in many bunkers refused to surrender, often fighting to the death. By early 1945 the last Siegfried Line bunkers had fallen at the Saar and Hunsrück. American units serving under British and Canadian command during the campaign incurred thousands more casualties, bringing total American losses to approximately 68,000. To this figure should be added the number of nonbattle casualties. The First Army incurred over 50,000 nonbattle casualties; the Ninth Army over 20,000. Thus the overall cost of the Siegfried Line Campaign in American personnel was close to 140,000. As a morale booster for British troops marching off to France, the Siegfried Line was the subject of a popular song: "We're Going to Hang out the Washing on the Siegfried Line". A French version by Ray Ventura (« On ira pendre notre linge sur la ligne Siegfried ») met a great success during the Phoney War (« Drôle de guerre »). When asked about the Siegfried Line, General George S. Patton reportedly said "Fixed fortifications are monuments to man's stupidity." In North Rhine Westphalia, about thirty bunkers still remain; most of the rest were either destroyed with explosives or covered with earth. Tank traps still exist in many areas; in the Eifel, for example, they run over several kilometres. In fact Zweibruecken Air Base, Germany was built on top of the Siegfried Line. When the base was still open the remnants of several old bunkers could be seen in the tree line as one was driving up to the base's main gate. Another bunker was located out side of the base perimeter fence near the base hospital. Once the base was closed workers digging up the base's fuel tanks discovered lost bunkers buried below the tanks. Since 1997, with the motto "The value of the unpleasant as a memorial" (Der Denkmalswert des Unerfreulichen), an effort has been made to preserve the remains of the Siegfried Line as a historical monument. This was intended to stop radical fascist groups making propaganda out of the Siegfried Line. ^ Kaufmann JE, Kaufmann HW: Fortress third Reich, page 134. DA Capo Press, 2003. ^ Atkin, Ronald (1990). Pillar of Fire: Dunkirk 1940. Edinburgh: Birlinn Limited. p. 28. ISBN 1 84158 078 3. ^ Kaufmann JE, Kaufmann HW: "Fortress third Reich", page 130-5. DA Capo Press, 2003. ^ Video: Dragon's Teeth. U.S. Army Pictorial Service. Retrieved 21 February 2012. ^ McNab, Chris (March 20, 2014). Hitler’s Fortresses: German Fortifications and Defences 1939–45. Bloomsbury Publishing. ISBN 9781782009511. ^ MacDonald, Charles B. (1961). The Roer River Dams. The Siegfried Line Campaign. Wikimedia Commons has media related to Siegfried Line.